I’ll take a closer look at the summer just gone once the Met Office has all the data out. But I have done some analysis on daily max temps for the Central England Temperature series. First, an update of a graph I did a couple of months ago, which was just for June. 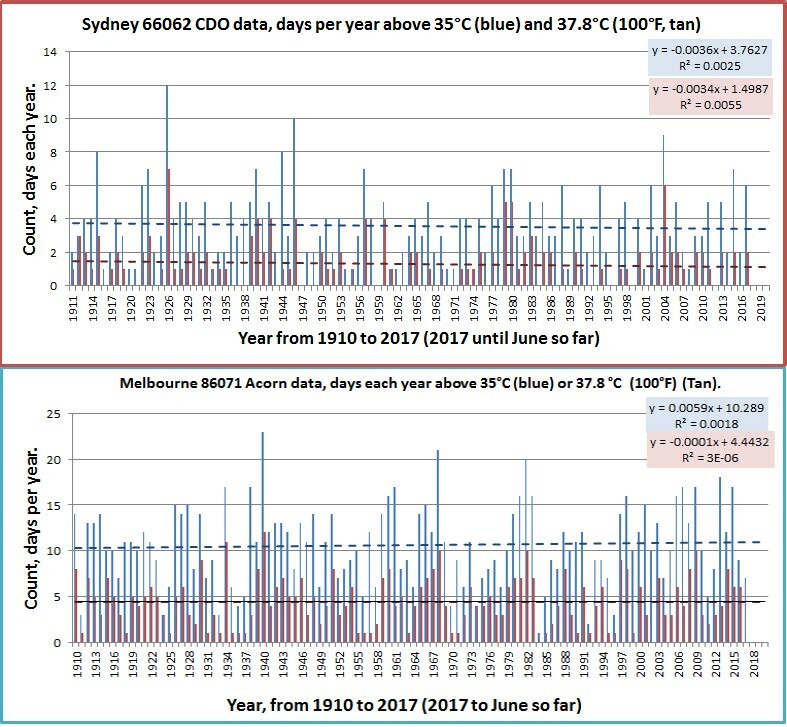 Although the summers of 1975, 1976, 1990 and 2003 stand out, there appears to be nothing exceptional about summer temperatures since. Zooming in on the days with temperatures of 29C and over, no year has got remotely close to 1976 for the sheer intensity of the heat that summer. The record temperature of 33.2C was set in 1976, and equalled in 1990. In the last decade, the nearest was 32.7C in 2015. The highest temperature this year was 29.8C, only the 49th highest one recorded since 1878. The Met Office have been telling us for years that severe heatwaves would soon become the norm. Isn’t time that they admitted they are wrong? Is there similar data for ‘minimums’ during the day? There seems to have been a dearth of daytime ‘warmth’ this summer. According to this guy, by the time we reach the Telegraphs doomsday deadline, the planet will be cooling rather quickly. Seems credible, well researched and perhaps consistent with the pause. And the worst bit is that the alarmists have wasted decades running round with their hair on fire when they could have taken advantage of the planet greening by 14% and figured out how to feed the poverty stricken better. But they didn’t. Their personal angst about dying a fiery death ensured they wasted a golden opportunity. Get rid of Kim Jong-Eun and other leaders in NK, get rid of Nicolás Maduro of Venezuela, get rid of … fill in the blank …, get rid of the “Green” crowd that wants to restrict reliable electricity to themselves, and so on. How to grow food and produce clean water are known. How to deal with nuts is not. Can we just start with the greens please? Kim’s not going to be a problem. No one whose serious about doing harm tell’s everyone he’s going to do it, he just does it, like the greens. Nor does it seem logical to be doing underground testing of a nuke, then tell everyone it’s ready to be put on an ICBM the next day. Maduro is not our problem. If his country doesn’t like what he’s doing, it’s up to them to remove him. When he starts lobbing around ICBM’s, then it’s everyone else’s problem. Maybe the bigger threat to Kim would be to send in the UN-NGOs followed by the UN Peacekeeper. Nowhere has successfully survived that dual assault on the country and it’s infrastructure. That’s for late July. What happened? Next: August — what happened. We are now into September. About 1976: Here in the Bay of Fundy, that was an exceptionally hot summer. We swam daily in the Bay in great comfort. The waterrs were warm and such a pleasure after the usual biting cold temperatures. Oh and it was a South local heatwave rather than the majority of UK. Well, Washington State could use some cool. Can we trade? Rain is also needed — we have forest fires. Will trade for rain from Texas if they want to ship some our way. Are you paying for tickets ? You need Al Gore and a Climate Change conference. Guaranteed to bring cold and wet weather. I remember an MP called Denis Howells, now there was a guy who could control weather, football …. pure magic! Extreme heatwaves the UK norm within decades? Whoever claimed that knew they’d be long retired before they could be called on it. Enough with these vacuous climate crystal ball gazers. This year isn’t over yet, some stories circulating of a global-warming-fueled Indian Summer with temperatures of 30C+ expected into November, probably the same source the Daily Express uses for it’s winter/snow predictions! Similar findings elsewhere. Remember, high UHI likely in this data, but still no heatwave evidence. Geoff. Don’t you just like quoting the Met Office’s worthless previous press releases. “These projections should not be confused with forecasts. The Met Office catchily describes them as the ‘most comprehensive set of probabilistic climate projections at the regional scale compiled anywhere in the world’. The report explains that: ‘The results are based on projections of hundreds of different variants of the Met Office Hadley Centre climate model, combined with results from 12 of the world’s other leading climate models, and information from past climate observations.’ In other words, they are not hard, experimentally verifiable science, but best guesses about what might happen given the limitations of the models, data and physics available to us. As is always the case, the ‘medium’ emissions scenario is the one thought most likely to happen, but it’s the ‘high’ emissions scenario that produces the really scary numbers and the shocking headlines. Indeed, the ‘high’ emissions scenario is so radically different from the other scenarios that you do wonder if it is there simply for pure PR scaremongering reasons rather than as an aid to practical government planning. sea levels will rise by about 36 centimetres by 2080 and there will be a nine-centimetre rise in the level of storm surges above and beyond the sea level rise. They don’t know any more than you or I! Amazingly, they forecast whatever “extremes” we have just had. I assume it’s because they tune the models to take int account whatever has just happened, and so end up forecasting more of the same. It is amazing how the memory plays tricks, the late 1950s and early 1960s seemed to be good summers to me at the time. Maybe, a few hot days don’t define a summer, 1976 was not just hot but consistently so: could do with another one. Is there a quality index for summers of some sort? Would probably incorporate sunshine hours, rain days and cooling degree-days: isn’t that real climate rather than the odd hot days beloved of “believers”? Thanks for the link, really interesting index. However, in the north east 1965 was a good summer as I recall …. memory must have gone too! Climate change might just be a minimal improvement in UK summers?? I can confirm that in the Lake District, summers are generally cooler than they were 30-40 years ago. This is clear from climbing experience, active days, clothing worn, it is anecdotal but obvious for anyone who sniffs the weather themselves. 1.2 degree change, that is quite a large drop. 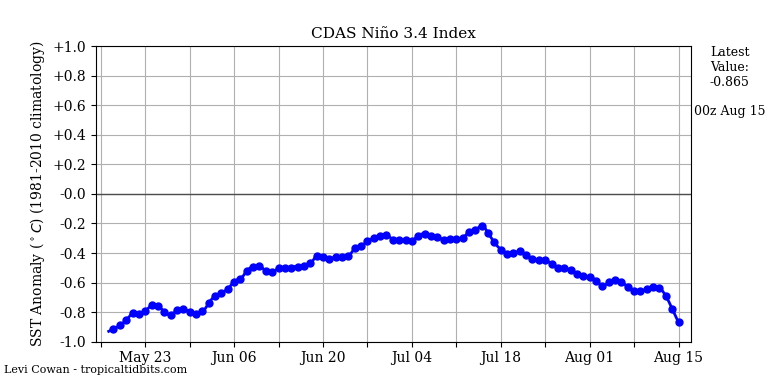 The 10% chance that there would be an El Nino in the next few months seems to have shriveled away. My present guess is 60% chance of Neutral and 38% chance of La Nina and 2% chance of El Nino. Wherever the word ‘expert’ appears, you’re about to read some clown’s often bigoted GUESS, at what may or may not happen. Safe to stop reading the article and move on!